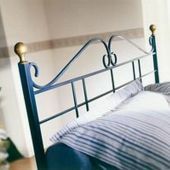 A very, very sweet ironwork motif: it's 'Caravaggio', a bed by Ingenia Casa. Available as single, queen or double-sized, 'Caravaggio' always makes a good impression. The 'Caravaggio' bed comes with or without footboard, or as a double-sized version with under-bed storage space, each standing out with its own fine elegance.